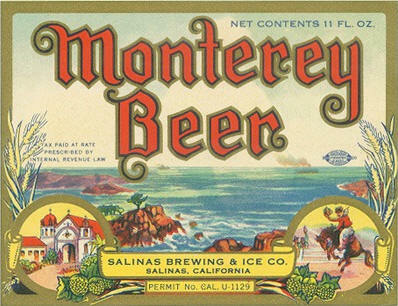 ﻿ History of the Salinas Brewery and the Monterey Brewing Co. 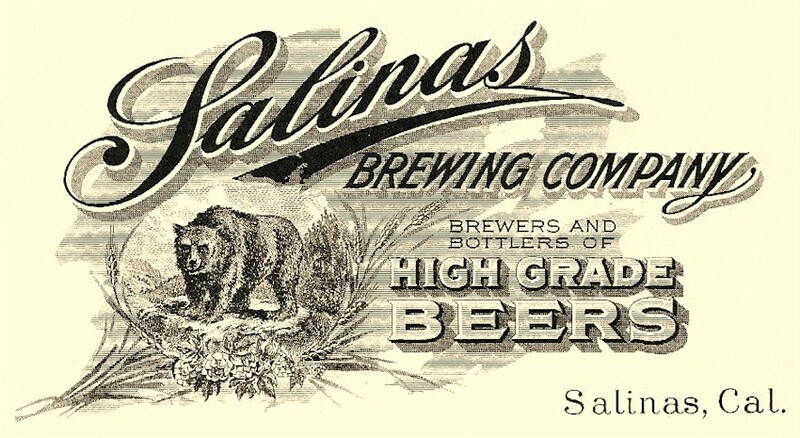 The Salinas Brewing Company and its successors, the Salinas Brewing and Ice Co., and Monterey Brewing Co. were all evolutions of Salinas' first brewing enterprise established in 1874. 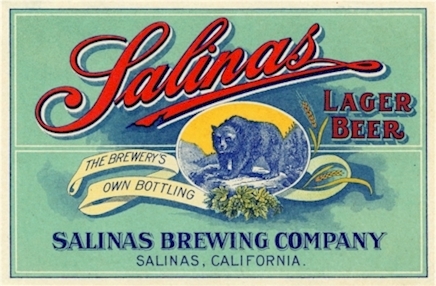 The "Salinas Brewery" was started by Lurz & Hagner, and had an initial output of about 240 barrels annually. The brewery was located on Castroville St., and operated under their management for three years, when in 1877 Hagner's half share was bought out by German immigrant, John H. Menke. Henry Lurz, a native of Bavaria, and John H. Menke of Hanover, continued to build the business, and by 1891 production had increased to 2,000 barrels/year. However, Henry did not live to see them break the 2,000 barrel mark. Their partnership ended with the death of Henry Lurz in 1889. 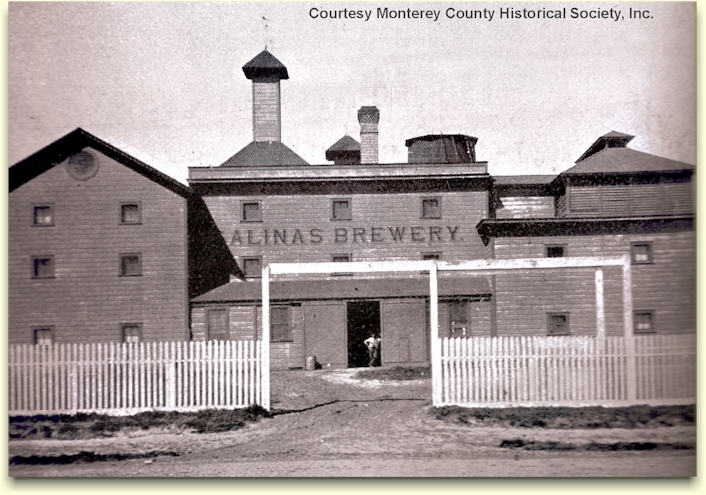 "The Salinas Brewery, owned by our enterprising citizen Mr. J. H. Menke, is situated about half a mile from Salinas City. It was erected in 1892 and the plant is one of the most complete on the Coast. The output is about 8000 barrels a year and the brewery, besides supplying Salinas City, also ships as far as Paso Robles and Santa Margarita. The building is a substantial three-story frame structure and is fitted with the latest machinery for the brewing of steam beer. On the ground floor is a 20-horse power steam engine, kettle and malt kiln, wash house, malt floor and filter room. On the first floor is the fermenting room, store-room, mash-tub and dryer, and on the top floor is the hot water tank, cooler and barley store-room. The output of the brewery can be increased to 9000 barrels in order to keep up with the rapidly increasing population of Salinas City. Mr. Menke, the genial and ever enterprising proprietor is one of the leading men of the city and was recently elected a member of the City Council." 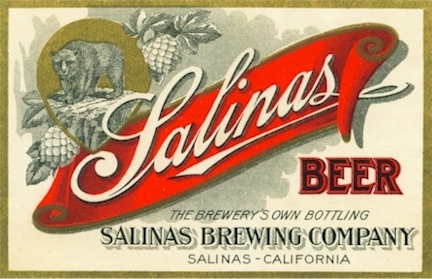 The firm was now doing business as the Salinas Brewing Co. In addition to draught beer for the saloon trade, beer was now available in bottles to include home trade. (embossed bottle at right). 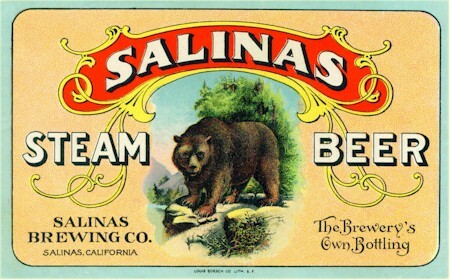 Their brands included "Salinas Steam Beer" (label above), "Salinas Lager," and "Salinas Beer" - and all carried their California Bear logo. The lower hook on the opener (below) is usually assumed to be a cap lifter for crown top bottles. However, it was actually used to flip up the wire bale that secured the porcelain stoppers on the blob top bottles. The square hole in the opener was used as a wrench to open gas valves of carbide head-lamps found on early automobiles. The round hole allowed the device to be attached to a key ring - thus the name "church-key." Menke operated the plant for thirteen more years, and on 24 August, 1904, he formed a stock company to raise capital for improvements. J. H. Menke was the president of the company, principal stock holder and Chairman of the corporation, with William F. Voss, as Secretary and manager of the brewery. There were seven members on the corporation's board of directors: J. H. Menke, Wm. Voss, Lawrence Martella, John Breschini, Henry H. Hollenstein, Fred W. Schroeder, and Fred W. Jansen. However, Menke removed himself from the day-to-day operations of the brewery, choosing instead to oversee the First National Bank of Salinas, which he had established in 1892. By 1905 the brewery's production had doubled to 4,000 barrels/year. 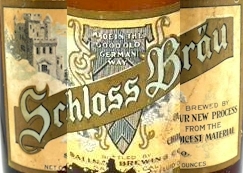 Steam beer was still being produced, and a Lager "Made in the Good Old German Way" - called "Schloss Braü" (i.e. Castle Brew) was added to their product line. However, they had outgrown the old frame building and had plans to build a new plant. 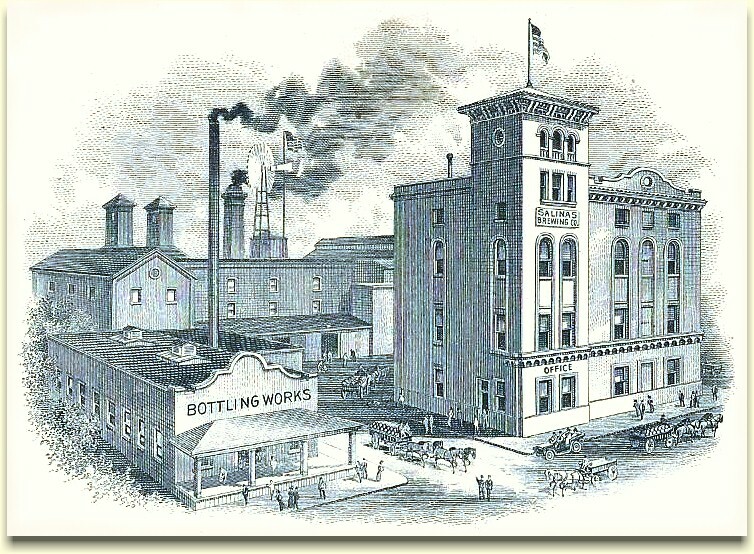 On 3 December 1907, the corporation increased the capital stock to $100,000 for their new brewery, which included a 30 ton ice machine and a bottling shop that could handle the new crown top bottles. By the spring of '08 the production resumed in a five story, brick structure located in central Salinas at 347 No. Main Street. The imposing new brewery towered over the other buildings of the city, and remained the tallest structure in Salinas until well into the '40s. They were now bottling their Salinas Lager, and Salinas Steam Beer in crown top bottles. J. H. Menke remained president & chairman, and Voss remained as secretary. The board of directors now consisted of the following: J. H. Menke, Nelson G. Christensen, F. W. Jansen, L. Martella, Frank Kopman, and H. H. Holenstein. Their brewmaster was John Bauer, but he was succeeded by Joseph A. Eckhart of Vallejo, who bought out Bauer's interest. Eckhart received his Master Brewer certification from the Whal-Henius Institute on 1 July, 1910. 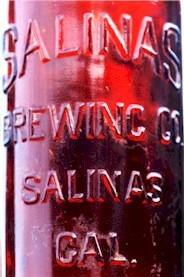 "The Salinas Brewery has a force of 16 or 17 highly skilled employees and has a capacity of 25,000 barrels annually. Today the Salinas Brewing Company is shipping its celebrated "Schloss Braü" over a wide territory, extending to San Mateo on the north to Santa Barbara on the south." In January of 1920, when the brewing of alcoholic beverages was terminated by national Prohibition, the firm remained open by producing soft drinks. The company also took up the ice & cold storage business, with William Voss still managing the plant. He maintained an interest in the Brewery, and was a vice president in the firm for a period in the late 30's. About that time, Voss also became a principal in the La Colma Wine Company of Salinas. 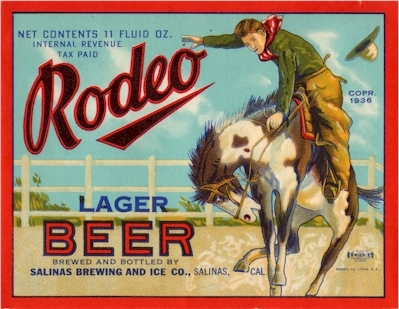 Considering the popularity, and profitability of "near-beer," the principals of the Salinas Brewing Co. decided to engage in the production of this cereal beverage. 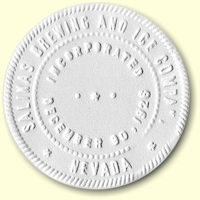 To that end, the Salinas Brewing & Ice Company was incorporated in Nevada on 30 December 1926. Having earlier returned to Germany for brewery training, William Voss assumed the duties of Brewmaster. Salinas Brg. and Ice Co.
With the end of Prohibition in April of 1933, many trained brewers were anxious to return to their trade. Anticipating Repeal, many took a proactive approach. One such brewer was JP Rettenmayer, past president and brewmaster of San Francisco's Acme Brewing Company. JP had attempted to establish a new brewery in Oakland, called the Samarkand Brewing Co. He was supported by previous investors in the Olympia and Acme breweries, and as brewmaster and plant supervisor, he enlisted the aid of his old superintendent from the Minneapolis Brewing Co., Armin L. Neubert , as technical advisor. However, JP could not raise the necessary financing and the project failed. Meanwhile, other entrepreneurs were seeking opportunities to enter the brewing business. 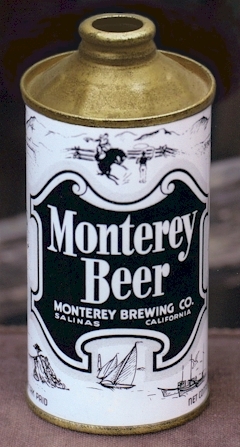 George Silver and Max Bayha, both with ties to the Nehi Corporation, raised the necessary investment capital to purchase the old Salinas Brewery in Monterey County, CA, but needed someone who new the brewing business. Armin L. Neubert was now a 70 year old, retired brewing engineer living in nearby Santa Cruz, but he had the necessary credentials. The group of investors persuaded Armin and his son to get involved. Armin was to receive equity in the new company as payment for his engineering work, and his son, Armin K., who had an engineering degree, was included in the venture. After the major improvements the plant reopened in March of 1934 with a annual capacity of 30,000 barrels. 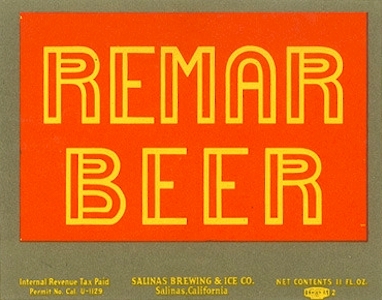 The Salinas Brewing & Ice Company was soon gaining recognition for its excellent beer. Armin, Sr. was the plant's brewmaster and chief engineer, and Armin, Jr. was the treasurer of the firm. 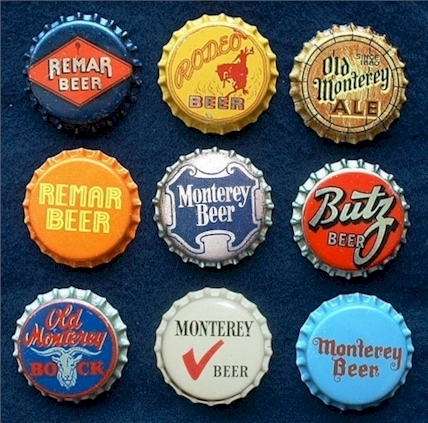 The Brewery's flagship brands were "Monterey Beer" (light & dark), "Monterey Ale," "Monterey Bock" and "Rodeo Beer" (pronounced ruh-DAY-oh by locals). 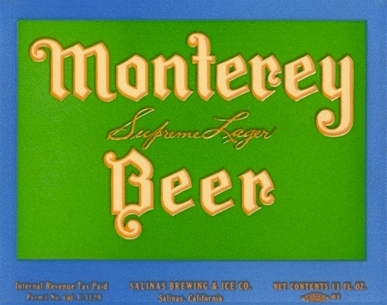 They also did a few contract brews such as: a "Surfside Lager," a "Cypress Beer" for the Wing Chong Co. of Monterey, "Mac's Special Lager" for Mac's Cafe of Salinas, and "Salute Lager Beer" for Terminal Liquors of San Francisco. 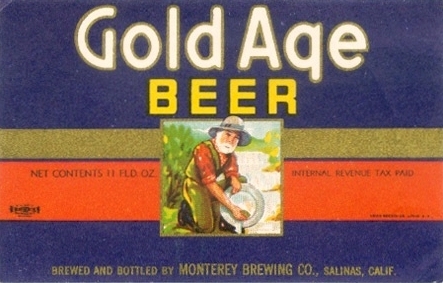 The label here is the earliest example from Salinas Brewing & Ice Co., ca.1934. 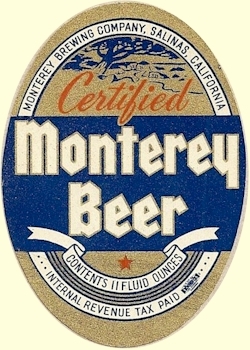 The "Monterey Beer" label below was one of the designs adopted the following year. They all display Permit No. CAL U-1129. U-Permit numbers were not required after 1935. 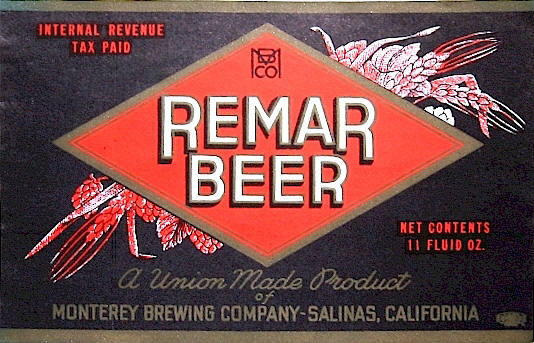 Thanks to JP, they also offered "Remar Beer" (with an art-deco label - below), which was actually a popular brand of bread introduced by JP's Oakland bakery in 1922. 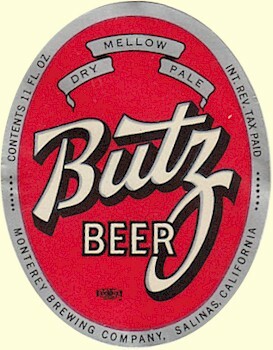 These 1935 labels, along with new packaging and color schemes were thanks to JP's wife, Philippine Schmidt Rettenmayer. 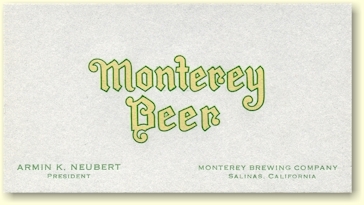 Assisting JP with the San Francisco based, Monterey Sales Co., she assumed the task of updating the image of the Brewing Company with colors and designs to appeal to the modern women, who made most of the beer purchases in the grocery stores. After JP's death, Armin Louis Neubert's son, Armin Karl, assumed the position of company president. William Voss, who had been a principal investor, and manager since 1904, was vice-pres. of the brewery, with Armin Karl's brother-in-law, George H. Ziegler, serving as brewmaster, and William L. Higdon, secretary/treasurer. Nine months following the death of Rettenmayer, a freak automobile accident took the life of Dr. William E. Fehliman. As well as a noted Santa Cruz surgeon, Dr. Fehliman was also a prime stockholder and director of the brewery. He was also an old time friend of Armin, Sr., from his days of running the Black Hills Brewery. With the loss of two of its major principals controlling the brewery's interests and their ongoing financial difficulties, on 5 April, 1937 the company filed for bankruptcy. By early 1938, the Neubert family had assumed total control and restructured the business. 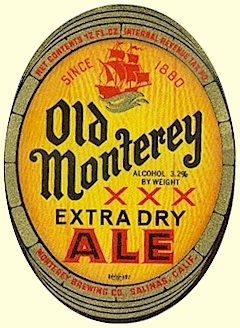 The "new" enterprise was named the Monterey Brewing Company - named for their most successful brand of beer. 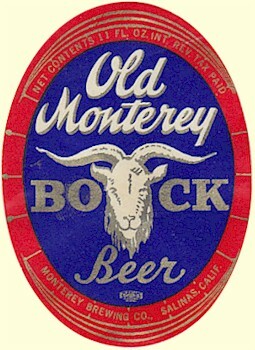 The newly reorganized company continued to market their most profitable brands: "Old Monterey Ale," "Old Monterey Bock," and "Rodeo Beer." They also added "Gold Age Beer" and "Butz Beer." 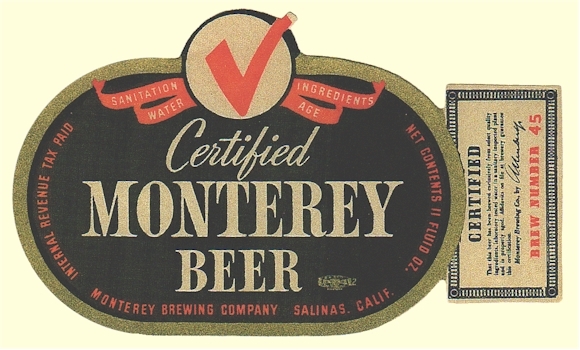 Plus, they updated the Remar label; and added "Certified" to their flagship brand, "Monterey Beer." 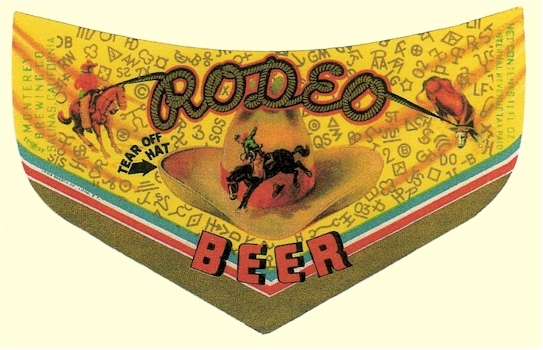 An interesting gimmick was the "Rodeo Beer label" (below) with a tear-away cowboy hat. 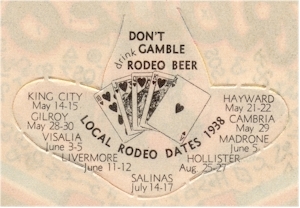 On the back side of the hat was the calendar for local rodeo dates. 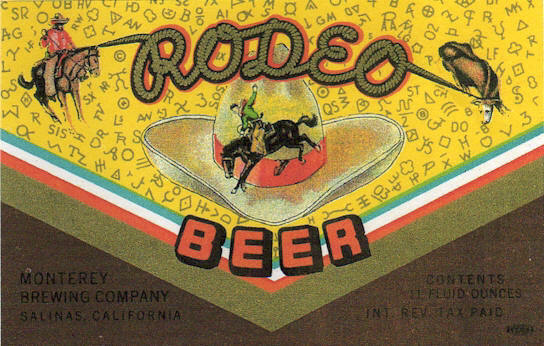 The rear of the label also carried the slogan: "Don't Gamble - Drink Rodeo Beer." Additionally, each label carried one of 1,000 different poker hands, which was often used to decide who bought the round of beers, or who won a cash pot. Also, one in every 1,000 was a label with a Royal Flush. This "winning" hand could be redeemed at the Brewery for a case of "Rodeo Beer" or "Monterey Beer." The addition of the slogan, "Don't Gamble" wasn't enough to appease the Alcohol & Tax unit of the IRS who decided it promoted just the opposite. So the labels had to be withdrawn, and new labels (above) were printed without the "tear off hat" poker hands. It's unlikely that many examples of the poker hand label have survived intact, since by design the labels were meant to be torn open. on the blue version of the can (at right). 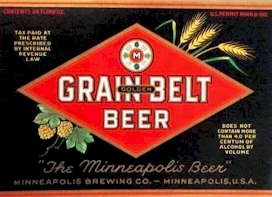 The new "Remar Beer" label (above) is surprisingly similar to this Grain Belt Beer label (left), from the Minneapolis Brewing Company. No doubt Armin, Sr. was paying a tribute to his (and Rettenmayer's) previous employer. However, in Minneapolis they were probably unaware of this dubious "compliment" coming from a small brewery 1600 miles away, in Salinas. In spite of the Neubert family's best efforts, the brewing industry itself was beset with difficulties due to shortages and rationing of raw materials for the war effort. They did land a contract to supply nearby Ft. Ord in early 1942, but it was too little, too late. After four lean years the family ceased production, and in late '42 they converted the brewery into a cold storage operation - the Salinas Freezer-Storage Co.
Armin L. Neubert died four years later on 3 July, 1946. He was regarded as one of the last pioneers of the brewing industry. See Armin Neubert's biography. Armin's son-in-law, George H. Ziegler, became an associate brewmaster at the Lucky Lager brewery in San Francisco in 1941, and in 1956 became supervising brewmaster for Lucky.